WOW! 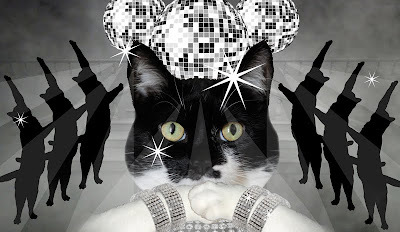 Thank you SO much for all of your wonderful comments on my Kitty Vogue video! It was super fun to make and we're still striking poses and singing along here at the townhouse. We asked you what your favorite part was and you answered! The hands-down fave was my 'bumping and grinding' scene. I bet you didn't know my g-string is LEATHER. 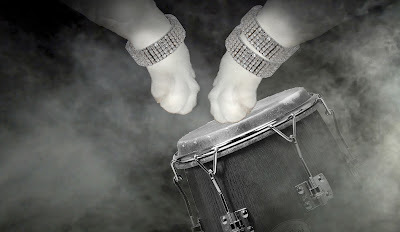 The bongos came in at a close 2nd. But no one mentioned noticing a riddle we hid in the credits. I think Daisy the Curly Cat was onto something because she noticed Mancat No. 1's name was Quinn. Sorry Daisy, but it's not Quinn as in Harley Quinn. Me and my Mancat Dance Troupe. 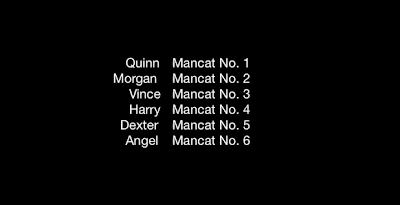 All of the Mancat names came from Glogirly's favorite TV show. ...so can you guess the name of the show? You can watch the video AGAIN to catch the credits. Very chic! Thanks for stopping by Teri's blog today and wishing Coco well! A while back, we lost our blogroll and we knew we missed adding a few kitties again...and Katie...you were one we missed and boy, have we missed a lot! That would be Dexter! It izz one of momzz and dadzz favorite serie's too! Thank YOU sweet Katie and your talented mammy for sharing such a wonderful video clip! By the way, love those boys, they are great dancers! We love Dexter, too! But Harley still thinks he was Mancat No. 1! Those dancing mancats were great!!! But the whole video was. I thought the G was for Glogirly! It was a tour de force! I think you are hundred times better than old Madge, but please don’t tell her as she will be upset! The humans are such pop culture luddites here - no pop music (only hard rock, alternative and metal), no TV reception (my human's boyfriend got mad at Time Warner several YEARS ago!). Do you know nobody here had even HEARD that song until we watched your video? So yeah, the TV reference was lost on us too. Well, WE thought the sammin pasties were the BEST bit(s), EVAR! HAH! You hit all my favorite parts. We don't like Madonna but your video was so good. We don't watch TV so I never heard of Dexter. I loved the whole video, so picking out a favorite part was really hard. Me STILL likes the Salmon! And Kozmo was hoping it was him! We have no clue on the reference...but Figaro is seriously upset that he wasn't one of the dancers. I mean, he's a tuxie and all that...and quite handsome. According to him. 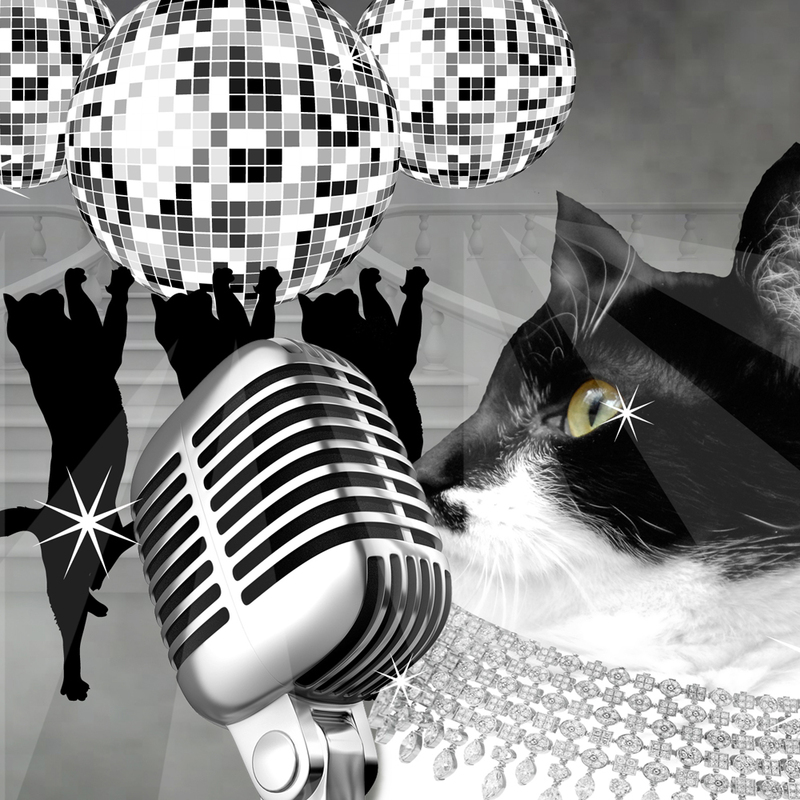 We loved the dancing mancats...but if you ever need a couple more...give us a call! I can't believe this. Youtube did it again! They're blocking videos because it has music content claimed by some big hotshot. Still, I had to see it. It was awesome. I have no whatsoever regret spending 5 minutes of my time seeing it. Your video was awesome. It's like me and GG are twins! I love Dexter and I did not notice it in the credits.